To reconcile the assumptions of uniformly weighted moving average (UWMA) estimation with the realities of market heteroskedasticity, we might apply estimator [7.10] to only the most recent historical data tq, which should be most reflective of current market conditions. Doing so is self-defeating, as applying estimator [7.10] to a small amount of data will increase its standard error. Consequently, UWMA entails a quandary: applying it to a lot of data is bad, but so is applying it to a little data. Exponentially weighted moving average estimation is widely used, but it is a modest improvement over UWMA. It does not attempt to model market conditional heteroskedasticity any more than UWMA does. Its weighting scheme replaces the quandary of how much data to use with a similar quandary as to how aggressive a decay factor λ to use. Consider again Exhibit 7.6 and our example of the USD 10MM position is SGD. Let’s estimate 1|0σ1 using exponentially weighted moving average estimator [7.20]. If we use λ = .99, we obtain an estimate for 1|0σ1 of .0054. If we use λ = .95, we obtain an estimate of .0067. These correspond to position value-at-risk results of USD 89,000 and USD 110,000, respectively. Exhibit 7.7 indicates 30 days of data for 1-month CHF Libor. 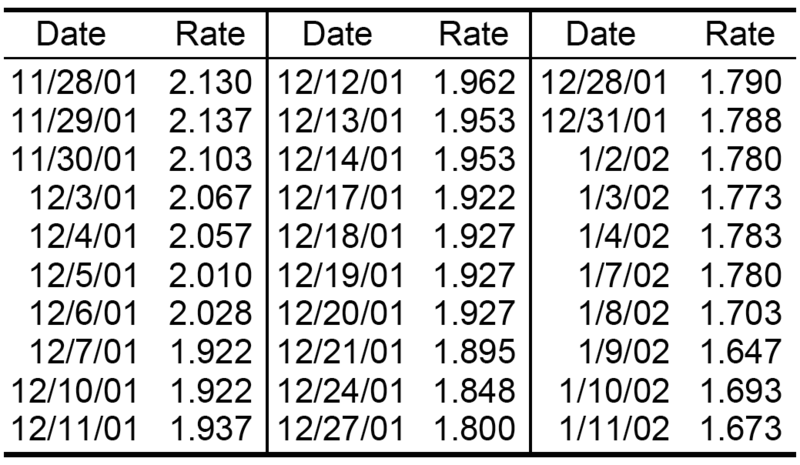 Exhibit 7.7: Data for 1-month CHF Libor. Rates are expressed as percentages. Source: British Bankers’ Association (BBA). Let R1 be a stochastic process representing daily values of 1-month CHF Libor. Assume terms tR1 have conditional mean t | t–1μ1 = t–1r1. Define white noise 1 with [7.4]. Apply [7.8] to calculate historical data for 1 from the data of Exhibit 7.7. Apply a uniformly weighted moving average to estimate and 1 | 0σ1. Use all available data. Apply a uniformly weighted moving average to estimate and 1 | 0σ1, but use sample estimator [7.9] in place of estimator [7.10]. Use all available data. Apply an exponentially weighted moving average to estimate and 1 | 0σ1. Let λ = .95. Use [7.20] and all available data. Compare your results from parts (b), (c), and (d).